“I am the Light of This World,” is the name of a song by The Reverend Gary Davis that I am currently completely obsessed with. It’s got a surpassingly sweet tune, seemingly simple, but actually a beautiful collection of voices woven around each other. The song rises and falls and goes round and round like water, and it feels good to let yourself get carried along with it. And the lyrics kill me. He doesn’t see the light, he doesn’t have the light, HE IS THE LIGHT OF THIS WORLD! He sings, “I’ve got fiery fingers, I’ve got fiery hands, And when I get up in heaven, Gonna join that fiery band.” I love the hopeful honest triumph of this whole idea. He’s not boasting, he’s stating the truth. I think of him as glowing, he sounds as though he’s glowing, and it must come out his finger tips and all along his hands as he plays his guitar, with so much skill and soul. He spreads the light with his music. I love to think about people having a light inside them, even being that light. I believe that this is something that every creature has, and as we grow and become jaded and mature, we learn to hide our light, we become closed and dark and careful. You can see it in dogs and children, though, everything they feel comes beaming out of them, unfiltered, unshaded, so bright and powerful you can warm yourself in their glow. I found a remarkable excerpt from an interview Gary Davis did with Elizabeth Lyttleton Harold, the wife of Alan Lomax. He’s so wise and funny and poetical. He speaks often of light, of his light, “It takes bitter medicine to do you good. But it’s a fact – I have had greater light on this experience about things, that’s why nothing don’t go hard with me. That’s the light that substantiate me to tell anybody what to weep and cry over and what to laugh over.” The light is knowledge, the light is faith, and the light is kindness and warmth. Again and again, Davis’ spirituality shines through as the strength to overcome sadness and trouble, and as the warmth of kindness, so that “You can know how to treat everybody, you know.” He describes death as a deep dark shower of rain, and lord knows that he’s experienced plenty of loss in his life, but he says, “I want to live as long as I possibly can.” He’s still got a lot of work to do, and as long as he’s in this world, he is the light. “The weakness of man’s strength and the brightness of his knowledge is what makes a man the finest of God’s creatures to walk the earth. I’m all the time studying what I can do for my people. You can’t do nothing for yourself unless you do it for somebody else first. You can’t bake a corncake for yourself unless you bake it for somebody else. It ain’t worth the effort. In this world we have to talk a little and hush a heap. I’ve been wanting to put white beans on a pizza for a long time. Why? I DON”‘T KNOW! I just thought it would be good, and it was good! I’ve put chickpeas on pizzas, and that turned out well. 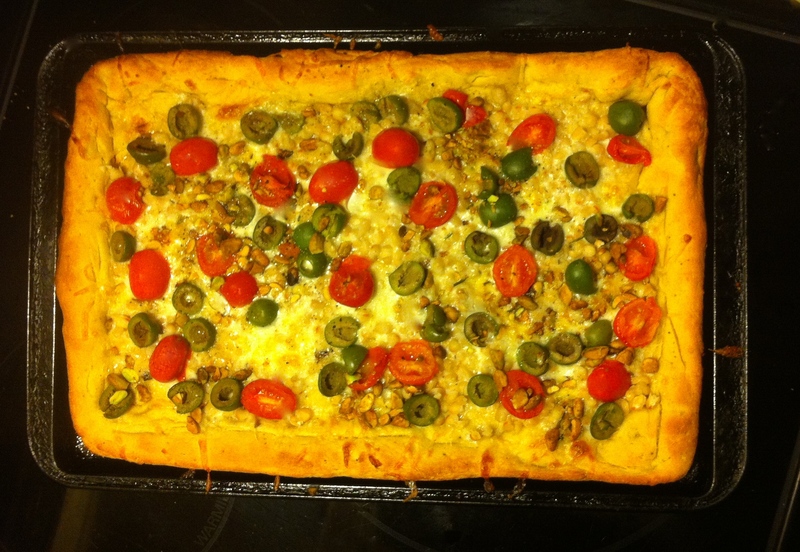 I wanted this to be a simple pizza, mostly white and green, with some flashes of red from the tomatoes. So it’s got pretty castelvetrano olives, tasty toasted pistachio kernels, white beans, and just a smattering of cheese. It’s a light and tasty affair. I added some chickpea flour to the dough, making it almost like a socca (except that it also has yeast and white flour in it!) I think this gave the crust a kind of earthy substantiality and crispiness that worked well as a base for all of these bright flavorful toppings. Here’s I Am The Light of this World. In a smallish bowl combine the sugar, yeast and 1/2 cup warm water. leave in a warm place for ten or fifteen minutes to get frothy. Meanwhile, in a large bowl or a food processor, combine the flours, rosemary, salt and pepper. Add the olive oil and yeast and sugar mixture. Mix well, or process until combined. Add just enough warm water to make a workable dough, starting with about 1/2 a cup. Process for a few minutes, or knead for 5 – 7 minutes until the dough is soft and springy. Form a ball, leave in a large oiled bowl, covered with a damp cloth, for 1 1/2 to 2 hours, until it’s doubled in bulk. Punch it down, and press it into a large, well oiled baking sheet until it’s all about 1/4 inch thick. Build up the sides to form the “crust.” Let it sit for 20 to 30 minutes to proof. Mash the roasted garlic and spread it over the crust. Spread the cheese over the crust. Use more or less cheese, as you like. Spread the white beans in an even layer over the cheese, and then scatter the olives, tomatoes and pistachios over the top. Bake until the cheese is bubbly and melted and the crust is golden brown, about fifteen minutes, but keep an eye on it! 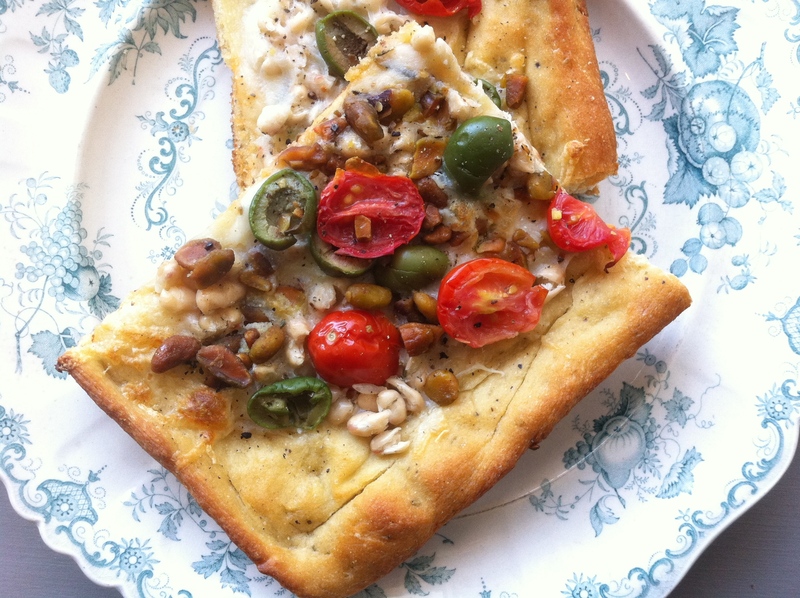 This entry was posted in beans, crust, recipe, tomatoes and tagged bean pizza, pizza, pizza with chickpea flour crust, socca, white bean pizza by Claire. Bookmark the permalink.